10/15/2006 - 1956 Anniversary Gala Concert at Carnegie Hall. 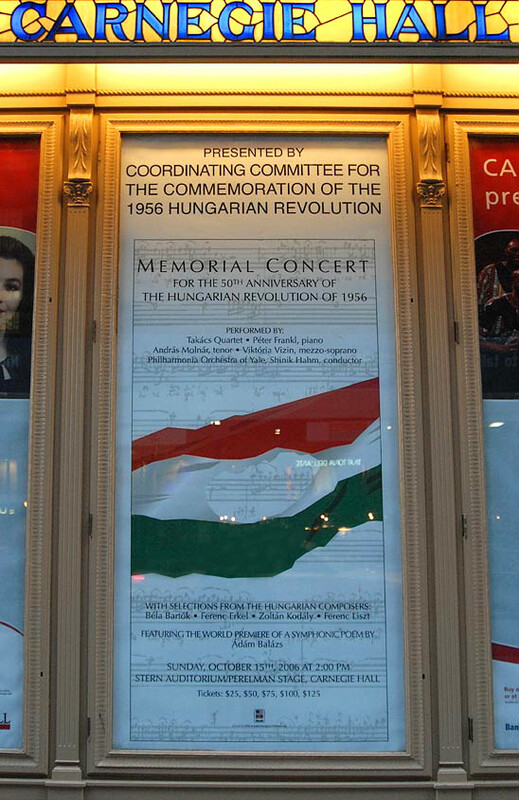 New York City’s Carnegie Hall hosted a Gala Memorial Concert commemorating the 50th Anniversary of the 1956 Hungarian Revolution organized by the Coordinating Committee for the Commemoration of the 1956 Hungarian Revolution. Dr. Paul Szilagyi, Chairman on the American Hungarian Federation's 1956 Committee, initiated the effort working with Geroge Lovas of the Hungarian Freedom Fighters Federation who would work to establish the Coordinating Committee for the Commemoration of the 1956 Hungarian Revolution. Numerous AHF members, local organizations and individuals joined the effort leading to this tremendous success. AHF seeded the fundraising effort with it's first $5000.00 and later provided accounting and good offices, enabling contributions of almost $250,000.00! The long-term plan is to finance, through donations, a permanent Memorial to the 1956 Hungarian Revolution to be located in New York City. Support this worthy cause. AHF would like to extend special thanks to it's members who played a key role on the committee, providing both financial and logistical and strategic help: Sandor Murray, AHF and NY 1956 Committee Treasurer; Stephen Varga, AHF President ex-Officio and Chairman of the William Penn Association; Arpad Drotos of the Hungarian Reformed Church of New York; Csaba Teglas; and George Lovas. 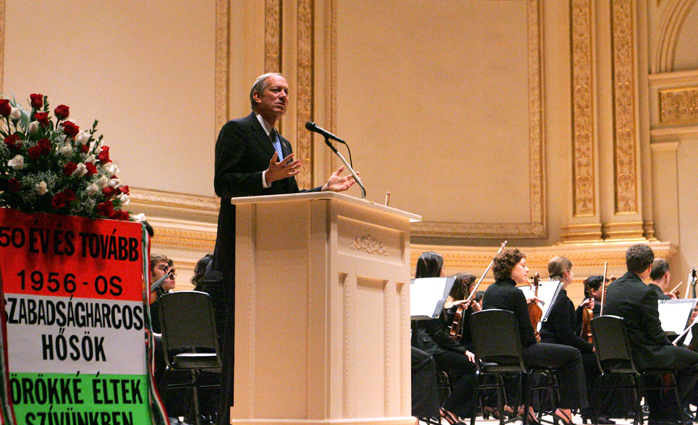 The Hungarian-born Governor of New York, George Pataki opened the Gala. Ambassador of Hungary András Simonyi read the greetings of His Excellency László Sólyom, President of Hungary. Hungarian Members of Parliament, Zsolt Németh, President, and Vilmos Szabó, Vice-President of the Committee on Foreign Relations, were present. The performing artists included the Takács Quartet, Péter Frankl (piano), Viktória Vizin, (mezzo-soprano), András Molnár (tenor) and Yale Philharmonia Orchestra with conductor Shinik Hahm. The musicians played works by Liszt, Bartók, Kodály, Berlioz, as well as worlks from Ferenc Erkel such as"Hazám, hazám" ("My Homeland Aria") from the opera Bánk Bán. The program also included a world premiere: “Path of the Extraordinary,” a symphonic poem by young Hungarian composer Ádám Balázs was commissioned for the occasion. Read more about the performers and program on the official Coordinating Committee page www.hungary1956nyc.org or on the New York Hungarian Culture page - www.culturehungary.org. The concert was preceded by a Memorial Mass at St. Patrick's Cathedral. January 13, 14, 15 - New York Area Concerts featuring Endre Hegedus, internationally renowned artist of Budapest, Hungary, to perform work of Liszt and Chopin dedicated to the 50th Anniversary of the Hungarian Revolution and for the benefit of the New York Area Coordinating Committee for the Commemoration of the 1956 Hungarian Revolution / Koncertsorozat az 1956-os Magyar Forradalom 50 éves évfordulója megünneplésére és az Emlékünnepeket Szervezo New York-i Bizottság munkája javára. 11/16/2005 - New York calling for Donations.... The Hungarian Revolution of 1956 was one of the most significant events in modern history, contributing to the eventual fall of communism. It also resulted in a large wave of immigration of Hungarians to the United States. The Hungarian American community is working together to organize a dignified and respectful commemoration of the 50th anniversary in 2006 and to create a permanent memorial to salute its heroes. This anniversary will hopefully enable the organizers to pass on to future generations the legacy of the Revolution. This noble cause has united more than three-dozen Hungarian community leaders and representatives of civic and religious organizations from the tri-state area, to form a coordinating committee for a series of commemorative events. Governor George E. Pataki is Honorary Patron and invited to participate. The committee’s efforts currently are concentrated on two main events planned in New York City on October 15, 2006. On this date an interfaith religious service will be held at St. Patrick’s Cathedral, followed by a concert at Carnegie Hall with opera divas Erika Miklosa and Andrea Rost, and other internationally renowned artists. The leadership and available members of the work groups had an informal work session at the home of Dr. and Mrs. Lakatos on Saturday, July 30th. Ten persons were present. The discussion centered on the formulation of concrete proposals to be presented at the next Coordinating Committee meeting on August 30th. The leadership has already made concrete steps to reserve Carnegie Hall for the afternoon of October 22nd, 2006 and to contact first rate performing artists in the US and Hungary. A similar informal work session will be held on Wednesday, August 17th at 7:00 PM at the Hungarian Reformed Church of NY (229 East 82nd Street, New York, NY). Its purpose will be to continue formulating concrete proposals for discussion and adoption at the next Coordinating Committee meeting on August 30th. Every member and prospective member of the Committee is invited to attend. 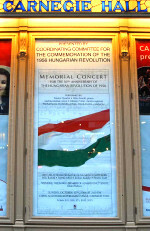 The Coordinating Committee for the Commemoration of the 1956 Hungarian Revolution was formed in cooperation with George Lovas and the Hungarian Freedom Fighters Federation, The American Hungarian Federation, the New York Hungarian House, the Hungarian Reformed Church, and others to plan for the 1956 commemoration events in New York. For more information, call the NY 1956 Committee president George Lovas at (718) 591-8438. The American Hungarian Federation donates 100% of all donations to this fund directly to the New York Coordinating Committee for the Commemoration of the 1956 Hungarian Revolution! AHF accepts all major credit cards and checks. AHF is a 501c(3) non-profit organization, so your donations may be tax-deductible. Your information is secure not shared with anyone. Donations are tax-exempt and are greatly appreciated. The list of contributors will appear in the Memorial Album. Copyright (c) 2005. The American Hungarian Federationtm. All rights reserved.